“I have been asked a million times what went through my mind when that puck slid into the goal. I have answered it a million times, but I will tell you one more time now what I even said to myself out loud when that puck went in the net - Dad would have loved that one." Canadian hockey hero Paul Henderson is releasing his memoir. Written with Roger Lajoie, Henderson's book is cleverly titled Paul Henderson: The Goal of My Life . Plenty has been written about and even by Paul Henderson over the years. His heroic goal in the 1972 Summit Series immortalized him in hockey and even Canadian history. Yet this book had the potential to be by far the best piece ever written on Henderson's life. That's because he has gone through a lot since that famous night in September 1972 - from alcoholism to finding god to reinventing himself to battling Leukemia. He has become a hero beyond the hockey rink, and his insights on life promised to captivate. The result is mixed. The book is enjoyable and easy to read largely because its subject is such a likeable hero in this country. It is well written as author Roger Lajoie expertly captures Henderson's voice, but ultimately it is a standard jock bio. It is a nice read, but no literary gem. It reads very much like a memoir of stories and advice Mr. Henderson wants to leave his grand-children. That might very well have been on Henderson's mind. He was diagnosed with lymphocytic lymphoma chronic leukemia back in 2009, and has bravely faced off with illness and immortality ever since. He never asked "why me?" or felt sorry for himself. Instead his appreciation for life has actually grown in the face of this adversity. In doing so he has become a hero all over again as he includes his illness in his many speaking engagements and helps others facing their own obstacles, be it cancer or otherwise. The book fails to bring the secrets to its readers. Henderson could have passed on his advice on how he faces every day with such positivity and zest for life. He could give any reader hope and set an example of how each of us can face our own challenges. Another great Canadian, Michael J. Fox, did that in his book and helped so many people facing Parkinson's. Henderson does not take this path. Perhaps it is because he refuses to let his illness define him. 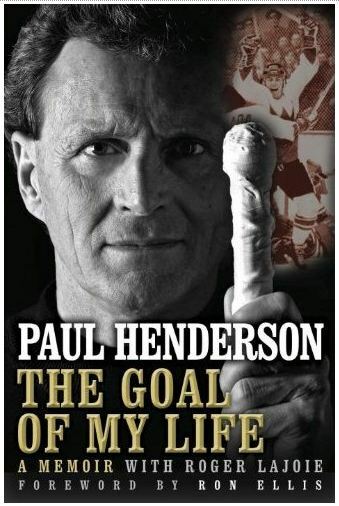 Henderson talks openly in the book about how appreciative he is that his famous 1972 Summit Series winning goal has changed so many people's life for the better. And that he is fortunate enough to continue to help people with his many public appearances. So it surprised me that devoted so very little space to how he deals with everyday life with cancer. Instead he takes the opportunity to talk about his spirituality. Henderson has become a devout Christian and his journey is well documented in the book and is a fascinating read. But at no point does he ever really come across as unwanted preaching. He is open about it and it is clearly a huge part of his life, but the book never forces that upon its reader. Paul Henderson is the all Canadian boy and his life makes for an interesting story. With the help of Roger Lajoie he tells his story in Paul Henderson: The Goal of My Life . We all know who Paul Henderson is, but if you really want to know who Paul Henderson is, this is very much a recommended read.